Hadn't cooked all week, and had the idea to do a down home meal, chicken fried steak, mashed taters, gravy and green beans plus the very first ripe tomato from the garden. Undoubtedly not the healthiest meal, but it was really tasty. Comfort food at its best. Was expecting a friend to visit after lunch, but she canceled and the kids and I were tossing around ideas about where we to go on a short vacation. We couldn't reach a conclusion so opted for watching our all time favorite Bob Marley video and dancing in the living room. 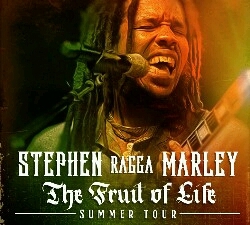 Didn't take long to tire me out so I started researching tour dates for Ziggy Marley. None of the dates for next week, which Erin has off from work, were close enough. Next I checked on Stephen and discovered he's playing in a small venue about 2 1/2 hours away. Tickets - $21.65...awesomely cheap for these days. And chairs, they have chairs!! I'm still in disbelief that I ordered tickets for Erin, Anah, and me. It's been years since I've seen live reggae, the closest I've come was Michael Franti, and even that's been years ago. I am so excited! It is as if my old self is waking up, wanting to get out, to do and see and experience the world again. Since my back injury I've been very isolated, not good for the soul or the body. I thought I'd never get better and as long as I kept thinking that I didn't. But something changed and I am grateful. Omg, a road trip. If this goes well, we just might try to see Ziggy in Colorado in August. Love is the answer and the inspiration. I love dancing to reggae. Have fun!